Apple has released iOS 10.1 for iPhone, iPad, and iPod touch. The latest version of iOS includes bug fixes and enhancements, but the most prominent feature is the inclusion of a Portrait camera mode ability for iPhone 7 Plus users. Additionally, Apple has released a bug fix update for Apple Watch and Apple TV, versioned as watchOS 3.1 and tvOS 10.0.1 respectively. Mac users will also find a Sierra update available, versioned as macOS 10.12.1. Users can also update via iTunes and a computer, either directly with iTunes update or with IPSW links below. Either way be sure to backup the iPhone, iPad, or iPod touch before beginning. Advanced users can also update to iOS 10.1 using IPSW firmware files, right-click and choose “Download as” and be sure the file is saved with an IPSW extension. Separately, Apple has also released macOS Sierra 10.12.1 for Macs, tvOS 10.0.1 for Apple TV, and watchOS 3.1 for Apple Watch. My iPad Air 2 shows an iOS 10 install option but it does not show which version. It does not say 10.1 directly. Any way of bypassing 10.0 and go to 10.1 directly? Yes if you go to Settings > General > Usage and delete the iOS 10 update, the iOS 10.1 update will download instead. Sorry, I disagree. 10.1 is quick minor update to the completely new OS that is 10.0. Definitely need to install 10.0 first, and a person is well advised to do some reading about it first. No, that is not true, anyone still running iOS 9.x can jump directly to 10.1 if desired. 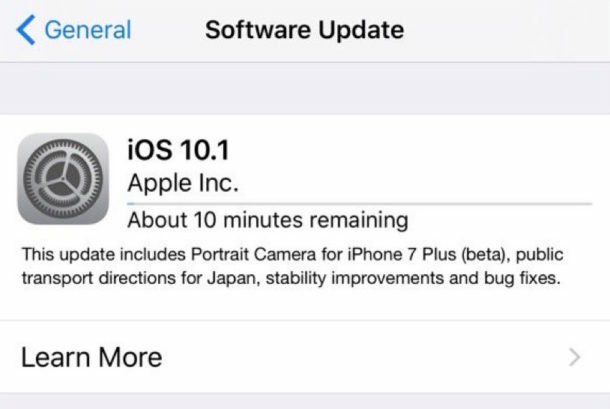 The iOS 10.1 update is minor for those of us who already have 10.0 but it will also include the iOS 10.0 update features for anybody upgrading directly from iOS 9. My iPad Air 2 shows an install option for iOS 10 which must be 10.0 with all its bugs. Is thrre a way of going to 10.1 first. I have the same problem as John Ferman, but there is no IOS 10 in Settings > General > Icloud and usage?! Problem solved. Suddenly update shows 10.1 available, so i think very busy Apple servers. I find the iPad Air 2 version only is iPad 5,4, not support iPad Air 2 WiFi version on Apple Configurator. Is a fix to restore “trash all” to mail on the works? I seem to have lost my update all button on my mac which is running Sierra, any suggestions? I have rebooted and still nothing. I have three updates showing but none is the new Sierra version. Thanks. This is iOS 10.1, it is not Sierra. Maybe reboot your iPad. I’ll say it: They’re updating “Maps” which no one uses, but not Pages? Am a little leery about installing anything without first researching and then making the decision of install or no install. The present 10.0.3 ( I think it is) is slower and less responsive than its previous IOS. 10 installed itself without my permission and is very slow. You must have accidentally given your permission for the iOS update. While it may have downloaded by itself, it could not have installed on its own without user intervention. Every iOS update requires the four or six digit device passcode to be entered before installing, as well as accepting Apple’s agreement. Also magnifiers will appear black screen and when press capture botton it will bring me to home screen..did anyone experience the same issue?.. Last but not least, can’t take a selfie.. 10.1 update..